Our country partners are the people who keep the best product coming our way. In certain circumstances we work directly with the artisans but many times we look to one talented individual or firm to represent us. We depend upon them to organize our product identification, purchasing and shipping. 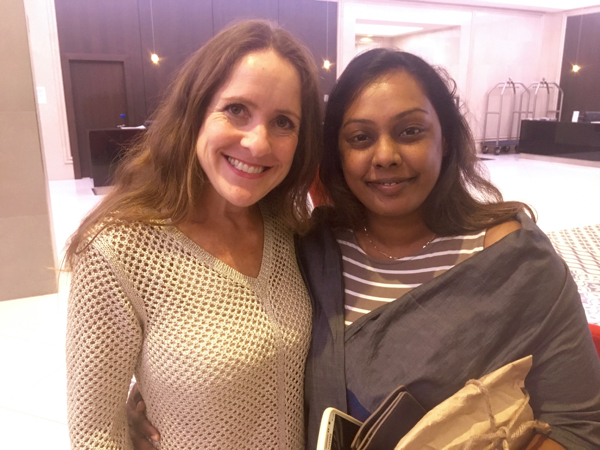 Achala works with Sewalanka, the NGO that originally took me to Sri Lanka, and is the co-founder of The Good Market. The Good Market brings together small producers of handiworks and natural or organic produce. The Good Markets now has over 400 vendors. Achala has been chosen as 2017 Women Entrepreneur of the Year. She has an MBA and an almost 2 year old daughter. Her growth since Susie worked with her in 2010-2012 is inspiring. We are in business because of Alan. It was while visiting his flagship shop, A.N.D. (Artisans and Designers) that Susie saw a clutch purse she loved. It was an "A Ha" moment. She decided then and there to speak to him about exporting to her in the US and she would build a business around it. Like all of Alan's items the clutch is ethically produced, sustainable and an opportunity for someone who is otherwise not on the economic ladder. He continues to build a dream workplace and team. In addition his production studio and shops are one of the rare places that actively hire disabled staff. Alan studied fashion design in London and Paris and was a pioneer in sustainable products in the early days of the movement. Our relationship with Kadode began eight years before Hands In. We first met the founder of Kadode, Jerome Benezech, in 2007 when a venture capitol company asked our founder, as an American on the ground in Cambodia, to approach them regarding a pepper production investment. Jerome shared his vision for ethical, sustainable production that would benefit farmers and allow them to continue to operate independently. I agreed with him and the VC firm did not, their relationship went no further. We continued to visit every time we were in the area and watched Kadode become the hub of the pepper renaissance. We are honoured to be one of the few importers to the US of this heady spice along with gourmands like Eric Ripert of Le Bernadin restaurant, we are a bit humble for that association but take great pride in representing the most ethical and sustainable of all the growers.